Email subscriber and I’d love a chance to win, thanks! i would love to win. i have not mastered shifting gears and using the cell. Love this site. Please enter me in the Motorola Roadster In-car Speakerphone Giveaway. I'm a Facebook fan also. I’m a Facebook fan also. Am a long tikme subscriber, the newsletter is great. Please enter me to win. Please enter me in the drawing. I enjoy reading your news lettter, it has been very useful for me. I’m already a subscriber and I’d love to win this! Yes! Yes! Yes! I want to enter! My fiance would love it if I won this because he always complains that I only call when I am in the car. I am an email subscriber. WOW!! I wish I could win!! I would love to win the In-Car speakerphone. I faithfully read your blog! Thanks for all the wonderful information. Please enter me in this giveaway. Im a subscriber. I would love to be entered for the drawing. I am a faithful reader of your blog. I read your newsletter everyday. I read your newsletter everyday. I love it. Please enter me to win the Motorola speakerphone. Good Luck to me. Thanks, Kevin. Send it to me !!!! I should win this contest!! Because, I’m an old fogie that needs all the help he can get in this world of technology. Pick me…. Pick Me… I’m the pretty one…. Oh yes please, sign me up to win! I’m a FB fan and subscribe to the newsletter both! i look forward to receiving your newsletter each day. you have offered many useful ideas which i have found very helpful. particularly in the area of gift giving and “need to have”. I’m in. I love this website. Let me be the one to go thru your ‘stuff’ and pick out the prizes! Count me in on the motorola Roadster. I would love to win this speakerphone. Here in California it is illegal to drive and hold your phone to your ear so you would keep me from breaking the law!! I subscribe to techlicious and I love the info it has helped me so much thank you. WIN WIN yes I would love to win the motorola roadster in car speakerphone. YES, I want to WIN !!! Please enter me in this great giveway. Please enter me in the contest! I’d love to win this. Could really use a speakerphone. Please enter me. Sorry if this is a duplicate, my computer is acting crazy this morning. What an awesome product! I would definitely love one of these! Never win anything but it is time to change that. 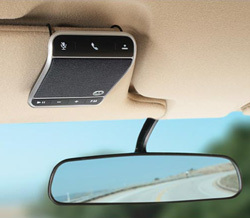 The Motorola Roadster In-Car Speakerphone would look great in my car. Please enter me in the give-away. Would Love to try this out, please enter me. Please enter me into the drawing. I would love to win / use the speakerphone.